Multiple Nobel laureates debated the claim that the 2008 financial crisis disproved existing economic theories at a panel exploring the research of Professors Eugene Fama (M.B.A. ’63, Ph.D. ’64) and Lars Peter Hansen, who were awarded the Nobel Prize in Economics this year, held Monday afternoon at the Reva and David Logan Center for the Arts. Professors John Heaton and James Heckman, winner of the 2000 Nobel Prize in Economics, presented on Hansen’s research, and professors John Cochrane and Tobias Moskowitz presented on Fama’s work. 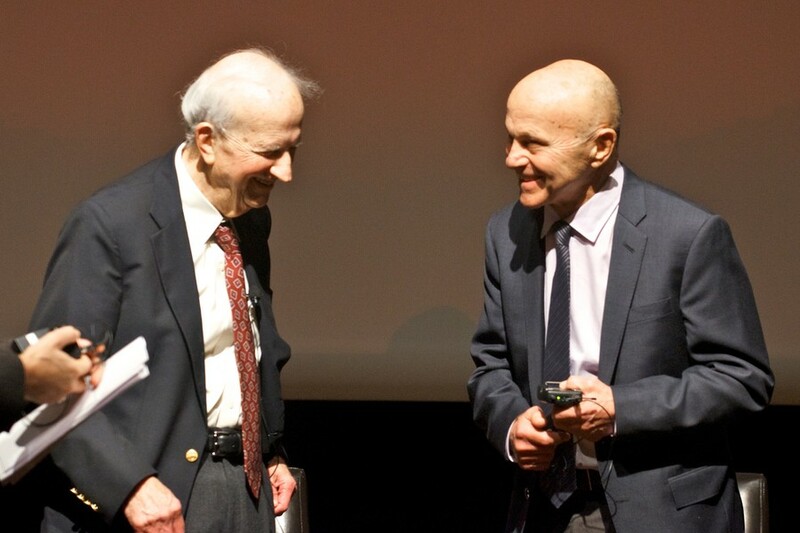 Professor and 1992 Nobel laureate Gary Becker (A.M. ’53, Ph.D. ’55) served as moderator. Heaton and Heckman discussed Hansen’s broad collection of research, including his far-reaching generalized method of moments (GMM), which Hansen developed in 1982 as a technique to help analyze economic models. Hansen’s work has provided an important framework for the research of other economists. Cochrane explored Fama’s concept of efficient markets: a market where prices always fully reflect the available information, and price movements are unpredictable. This theory of efficient markets has many practical implications. For example, “professional managers should do no better than monkeys with darts at picking stocks,” he said. Moskowitz clarified the importance of Fama’s more recent work on asset pricing, for which he was awarded the Nobel Prize. “Prices are ultimately what determine resource allocation, where we invest as an economy into productive assets. Prices are going to determine that,” Moskowitz said. “In some quarters of economics, we were unprepared,” he said. Cochrane said that the financial crisis offered an opportunity to see how accurate theoretical economic models were. Moskowitz argued that the financial crisis offered a valuable challenge to economic theory.